An economic stimulus package is an attempt by the government to boost economic growth and lead the economy out of a recession or economic slowdown. The two main ways for stimulating the economy are expansionary monetary policy and expansionary fiscal policy. Though it tends to refer to fiscal policy. Tax cuts. Cutting income taxes increases disposable income and therefore causes people to spend more. Tax cuts are more effective if they are targeted at people on low incomes because low income earners have a higher marginal propensity to consume. Government spending increases. 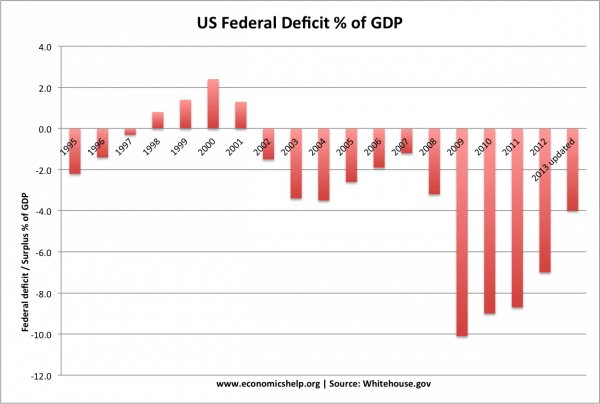 Higher government spending represents an injection into the economy and should cause higher Aggregate demand. In February 2009, US congress approved a package that comprised new Federal government spending in infrastructure, health and education, and unemployment assistance. There were also new tax cuts. Economic stimulus of Obama administration. Higher government borrowing, leading to higher debt to GDP. May not be effective in increasing aggregate demand. E.g. people may save their tax cuts. May cause crowding out – This is when higher government spending leads to an equivalent fall in private sector spending. However, Keynesians argue if the stimulus package is implemented in a period of a negative output gap, crowding out will not occur because there are surplus savings in the economy. If Congress cut taxes for the wealthy and highest earners, this stimulus would have a small multiplier effect. This is because if the wealthy gain tax cuts, they may only spend a small percentage of the extra income. If low income earners receive tax cuts, the multiplier effect will be great because they will spend a higher percentage of this extra income. The most effective types of stimulus in Keynesian models tends to be infrastructure spending which involves hiring unemployed workers. If the unemployed gain work, the multiplier effect will be larger. If the stimulus involves cash transfers (e.g. higher pensions) there will be less direct effect on the economy. The impact on wider economy also depends on how efficient the infrastructure spending is. For example, if the spending helps to reduce traffic congestion, the economy will benefit from long-term supply side benefits too. If the infrastructure spending goes on misplaced projects, the productivity effects will be much less. Some economists argue, it can be difficult to find sufficient infrastructure spending projects to spend money on all at once. However, it is worth pointing out Keynes argued the primary goal of fiscal stimulus was to boost aggregate demand and policies were worth pursuing in a recession – even if it involved digging holes in the ground. Cutting interest rates should increase consumer spending and investment. Depreciation in the exchange rate which can boost exports. What determines effectiveness of monetary policy?